EarlyWorks is a comprehensive early childhood programming, documentation, portfolio and family communication system. EarlyWorks simplifies and streamlines all aspects of childcare documentation and programming across an entire service. Automatically create reports of individual child development and progress in relation to learning outcomes of any learning framework as well as developmental milestones. Administrators and Educators can contribute towards the service’s Quality Improvement Plan. Ease of access and simple input design enable the QIP to be a living document that continuously evolves over time. 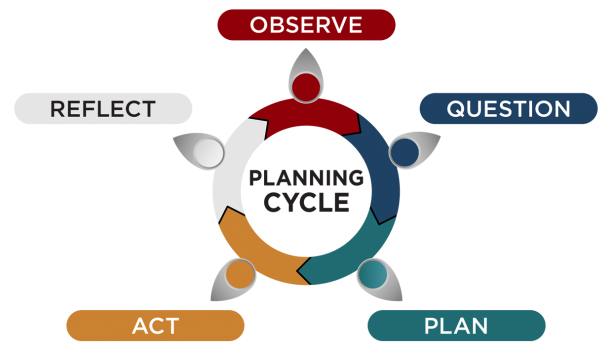 Step by step processes for planning and observation ensures a clear and visible cycle of planning, documenting and evaluation. Educators reflect on programmes using links to the Principles, Practices and Quality Areas of the NQS. Managers and co-ordinators can provide feedback to educators with the ability to include this in the service’s Quality Improvement Plan. 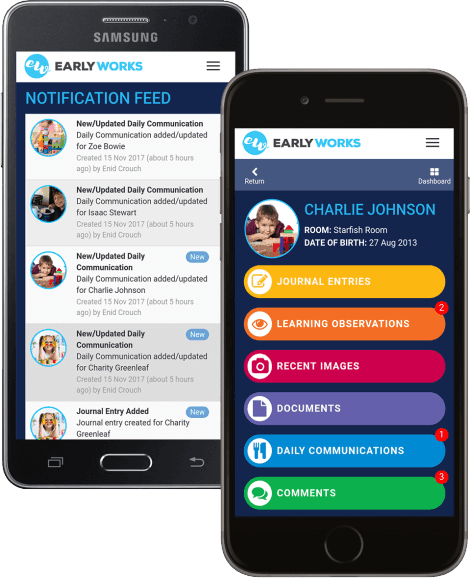 EarlyWorks makes it easy to keep families informed about the program and their child’s progress in real time. Educators, administrators and families can keep track of birthdays, special events, tasks and excursions with EarlyWorks’ event calendar. The EarlyWorks Incident Report has been developed inline with ACECQA requirements. It allows you to quickly and easily record the details of an incident as well as any follow up actions that have been taken. With a consistent push towards sustainable practices from ACECQA, EarlyWorks’ automated online incident reporting has been designed with sustainability in mind. Parents/guardians are automatically notified when a new Incident Report has been added to their child’s record and are prompted to complete and sign the form from their computer or smart device. 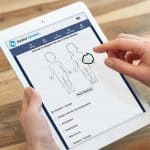 Using specially developed FormWorks technology, families and educators can sign the Incident Report form online, directly from their phones, tablets or computers – reducing printing and paper costs. This same technology allows educators to mark where on the child’s body an injury has occurred, just as they would on a paper form. Includes parent reminders and optional manager authorisation features. All forms are saved within EarlyWorks but can also be exported as a PDF for printing or saving elsewhere. EarlyWorks automatically generates reports of every child’s learning and development in relation to the EYLF, MTOP, state-based framework (e.g. VEYLDF), developmental milestones and/or any customised framework, making it easy for educators to keep track of documentation. EarlyWorks automatically generates checklists for each room, showing which outcomes have been planned for and/or observed in each quarter. EarlyWorks also automatically generates charts for each room and for each child, showing a comparison between outcomes planned and observed. Families can readily access daily communications about meals, bottle feeds, nappy changes, sleep and rest times. Families can view and provide feedback on observations, journal entries, and image galleries. Individual family members can engage in online discussions with educators. 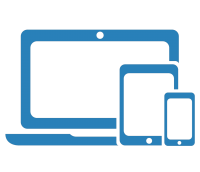 Families can enjoy secure access from any device that is connected to the internet including desktops, laptops, tablets and smartphones. Parents can request login access for multiple family members, carers, and other support professionals. Families and educators can download the free EarlyWorks App from Apple Appstore or Google Play. All the functionality of the cloud-based version of EarlyWorks with the option of push notifications. Download the native EarlyWorks app for iOS and Android. To promote continuous improvement, it is an NQS requirement that childcare services have a system in place to support the recording of regular reﬂective practice. EarlyWorks supports reflective practices such as Weekly Reflections to assist educators in improving their knowledge, skills and practices. This in turn creates the best outcomes for children, families and the service. EarlyWorks allows educators to reflect on programmes and practices with links to the Principles and Practices as well as the Quality Areas of the NQS. Managers and co-ordinators provide feedback with the ability to include this in the service’s Quality Improvement Plan (QIP). EarlyWorks also supports collaborative reflection using programme comments. This allows educators and managers to create reflections at any point during the Planning Cycle. 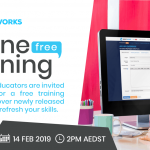 EarlyWorks has been designed by industry specialists to support managers and educators in delivering high quality early childhood educational documentation while being simple to produce and easy to use. Observations, Programmes, Journals, Reflections, Children’s Learning Portfolios even the service’s Quality Improvement Plan become almost effortless with EarlyWorks. EarlyWorks comes preloaded with learning outcomes for the EYLF and the My Time, Our Place Framework for School Age Care. You can also include other learning frameworks (e.g. Kindergarten Curriculum Guidelines, Montessori Curriculum, Te Whāriki). Services can also personalise the outcomes available to include additional items such as their service philosophy, theorists, or any other area referenced within a program. EarlyWorks’ observations and program planning follow a clear planning cycle of observe, question, plan, act, reflect/evaluate. Educators are alerted to incomplete evaluations to assist in completing the planning cycle. EarlyWorks’ flexible educator completed templates complement a variety of documentation styles from learning stories through to short jottings. Editable formats allow educators to design their own unique style in Microsoft Word or use the existing professional layouts for printing. The ACECQA planning cycle is a process of professional observation, planning and evaluation used by early childhood educators to assist in developing high quality early childhood education programs for children. This cycle is often referred to as the five steps of the planning cycle as shown below. Observe – the process of gathering information. Analyse – questioning what learning and development is taking place to make meaning of what has been observed. Plan – planning the next steps to continue supporting learning and development. Act – putting the plan into action. Reflect – evaluating the effectiveness of the plan.